There are plenty of oddities in the world of Red Dead Redemption 2. It turns out that when Rockstar Games create a Wild Wild West, it can be a strange, strange place full of curios and characters that are so unforgettable. 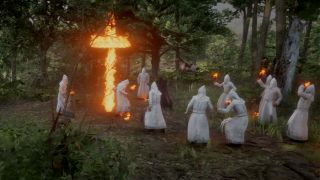 And possible the most controversial of these is the Red Dead Redemption 2 KKK. It's one of the most bizarre Red Dead Redemption Chance Encounters is one you kind of have to let happen on its own. You find them by accident as you stroll around the Red Dead Redemption 2 map near Southfield Flats, just by Rhodes, but then they're also going to appear elsewhere across the locale. That's just one of the hilarious encounters we've had in Red Dead Redemption 2 so far. The world is full of little stories like these, and we've started collating some of the random encounters we've had under the Twitter Hashtag #RedDeadStories, so if you have any of your own that you want to share, then let us know. But for now, just head out on your trusty steed and get to know the world of Red Dead Redemption. Trust me, you're going to enjoy it. Want more tips for enjoying the Wild, Wild West? Check out our extensive (and regularly updated) Red Dead Redemption 2 tips.